A Barbie doll with a cake skirt - Barbie cake is a perfect cake for a wonderful princess birthday party! DIRECTIONS: Barbie cake is made of two cakes. Bake two sponge cakes or use another cake recipe you like. 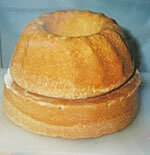 Sponge cakes: Whisk together flour and baking powder in a bowl. In another bowl, beat eggs and sugar with an electric mixer until pale and thick. Add boiling water stirring constantly. Add the flour mixture. Mix until smooth. Pour batter into buttered and floured round pans, a round pan and a tube pan. Bake for 30-40 minutes (oven preheated to 180 � C / 350 � F) until the cakes are golden brown and begin to pull away from the sides of the pans. Let the cakes cool completely. Halve both cakes horizontally with a long knife. Moisturize all the layers with juice. Beat whipping cream until soft peaks form. Mix in 3-4 tablespoons sugar and some vanilla essence or vanilla extract. Spread raspberry jam over bottom half of the cakes, arrange banana slices on the jam and spread a little whipped cream over the banana slices. Press gently. 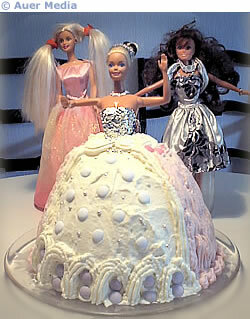 Carve a small hole in the middle of the bottom cake for a Barbie doll. Save the crumbs. Spred jam, banana slices and cream over the bottom cake and place the top cake on it. Wrap the Barbie doll in aluminium foil and form the upper end of the foil as a top. 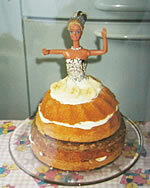 Place the Barbie doll standing in the middle of the cake. Mix some whipped cream with the crumbs and fill the hole around the Barbie doll with cream mixture and banana slices. The skirt should reach Barbie�s waist. Separate one third of the whipped cream and colour it pink with red food colouring. Spread it on the back side of Barbie�s skirt. Spread white cream on the front side. Make the arches using a piping bag and star nozzle. 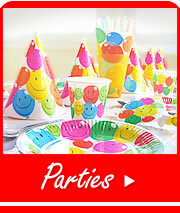 Decorate the cake with sweets and silver ball decorations like Barbie�s skirt in the picture. Barbie�s friends in the background are standing in tall drinking glasses. Welcome to the party!